There is a lack of authentic medieval fashion out there, especially for the later period, and even more especially for elder women. Therefore, I have uploaded my second set of gowns for this period. As before, they feature a high waisted hemline, fur collars, and fur trimming suitable for court wear. This particular style was fashionable for about thirty years or so in England, with some variation. These gowns come in two colors, as you can see. Don't forget to download the wonderful mesh by Aligeth, which is perfect for this type of style. The gowns were especially made for elder high bred ladies, but can also be worn by adults. 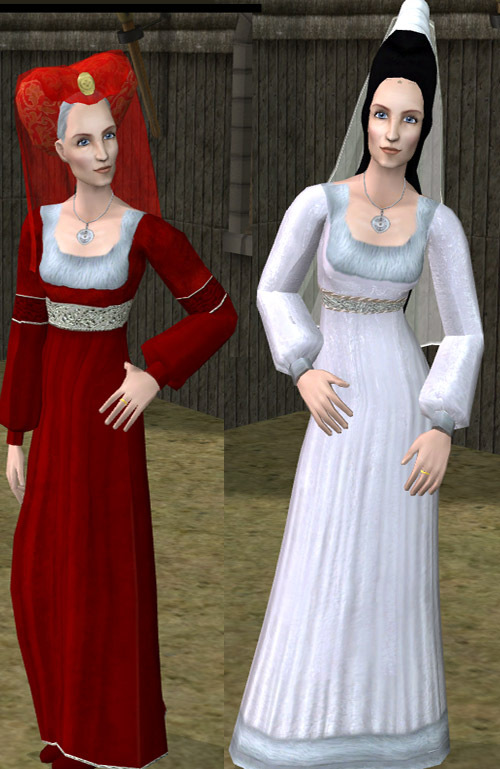 Both the tall white hat and the red hat are recolors of meshes I found at Bipsouille Sims. 394 people have said thanks to child_of_air for this download.